Arizona Center Farmers Market Opens in Downtown Phoenix - Downtown Phoenix Inc.
Arizona Center is bringing a new weekly farmers market to the heart of Downtown Phoenix. Open every Wednesday from 4-8 p.m., the new Arizona Center Farmers Market is kicking off later this month on Wednesday, Jan. 23. More than 40 local small businesses and farmers will congregate in the center’s lush Grotto space, offering fresh produce, specialty food items, prepared foods, crafts, and body care items. Vendors include Arizona Bread Company, Big Red’s Hot Sauce, Doctor Hummus, Fluffy Vegans, Los Muertos Salsa, Midtown Microgreens, Pink Honey Candle, Sun Tan Honey Farms and more. Arizona Center is an ideal location for a farmers market, due to its central location on Third St. and Van Buren in Downtown Phoenix. Patrons can enjoy shopping for local goods in the unique open-air urban oasis, making it convenient for all those who live and work nearby to replenish their groceries midweek and find unique, handmade items. Parking is available as well for those who don’t live within walking or biking distance. “We are thrilled for the opportunity to team up with Arizona Center to provide the local residents, students, and tourists the best vendors in the Valley. We look forward to serving the downtown community,” said Salomon Aliser, market organizer for Arizona Center Farmers Market and founder of Pinnacle Peak Farmers Market. 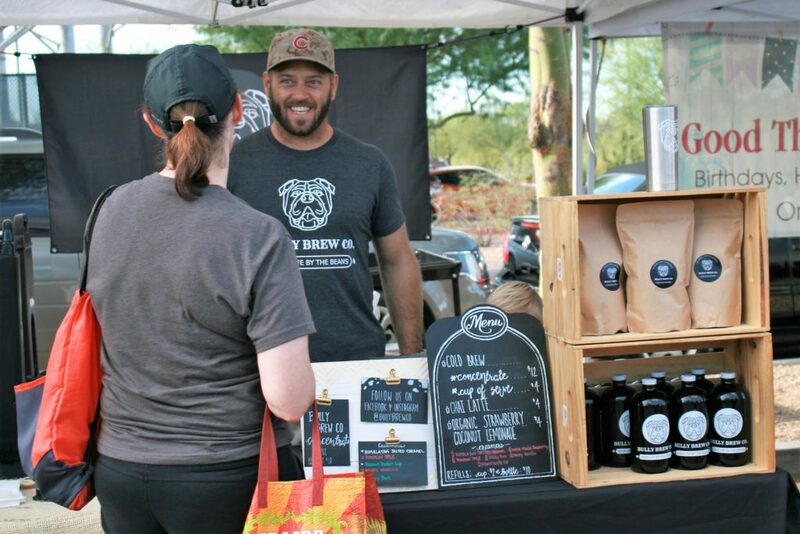 In addition to the midweek farmers market, Arizona Center is also hosting monthly pop-up markets with unique local vendors. More information about these pop-ups is coming soon. For more information about the Arizona Center Farmers Market and other upcoming events at Arizona Center, or to host your own event at Arizona Center, visit www.arizonacenter.com/events. Arizona Center, located in the heart of downtown Phoenix at Third and Van Buren streets, is a one million-square-foot mixed-use project. It’s where entertainment, shopping, events, dining and prime office space create a unique, centralized hub for all that Downtown Phoenix has to offer. Amidst many Phoenix points of pride including the Phoenix Convention Center, many hotels, Talking Stick Resort Arena and Chase Field, the new Arizona Center is an urban downtown oasis. For more information, visit www.arizonacenter.com, follow @theazcenter on Twitter and Instagram, and @ArizonaCenter on Facebook.